After I read the story about the death of Iwao Takamoto, the animator that created Scooby Doo, it raised a fond memory of my mother. 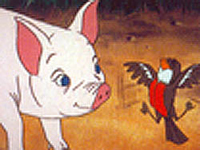 The story included the fact that Mr. Takamoto directed the original animated movie version of Charlotte's Web back in 1973. I was in the 4th grade (I'll save you the math...I'm 43) and my mother organized a class field trip to see the movie. Any time we took a field trip it was something special and I was proud that my mom had put the whole thing together and went with us as a chaperone. Field trips were always so official with permission slips and all. As we live in a somewhat rural town that was even more rural over 30 years ago, we took several school buses for the trip that took about 45 minutes. For those of you that live in the area, remember there was no Collar City Bridge or Alternate Route 7 that now cuts the travel time down to 20 minutes. We had to take the new Congress Street bridge to I-787 to I-90 to I-87. On the way home, we got to come back over the Congress Street bridge which includes a tunnel that goes under Russell Sage College. Of course, the kids all screamed "beep the horn" to the bus driver in the tunnel to hear the echo reverberate. And when you're really clever, you honk towards the end of the tunnel so the echo goes backwards. Oooooo! The theaters, Cine 1-6, were a huge "megaplex" that are now closed and have given way to several 10+ screen complexes. I don't remember anything about the trip or the movie except that Paul Lynde was the voice of Templeton the rat.